Michael Davis with the Beacon Hill Black Alliance for Human Rights speaks during the Sept. 11 Decatur School Board meeting. Photo by Sara Amis. 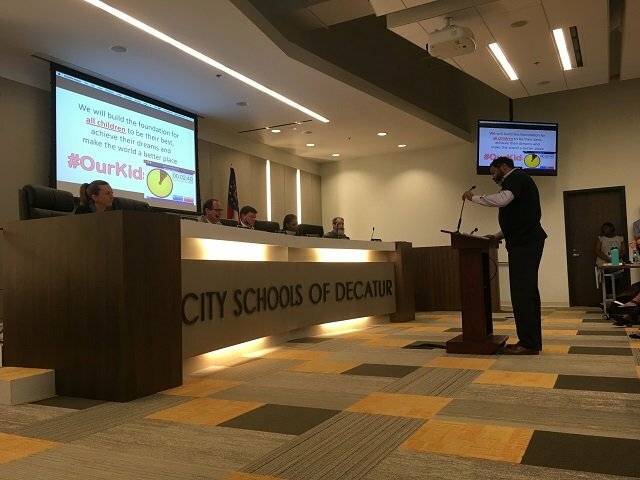 City Schools of Decatur has a plan to address racial disparities in disciplinary action, academics, and extracurricular activities. Parents and students from the Beacon Hill Black Alliance for Human Rights say the plan is not enough. “We have met for two years and attended every meeting we have been asked to, but our children still suffer. Enough is enough. We are demanding an immediate change,” said Deborah Mitchell, Co-Chair of Beacon Hill’s Education Committee, in a statement released prior to the meeting. 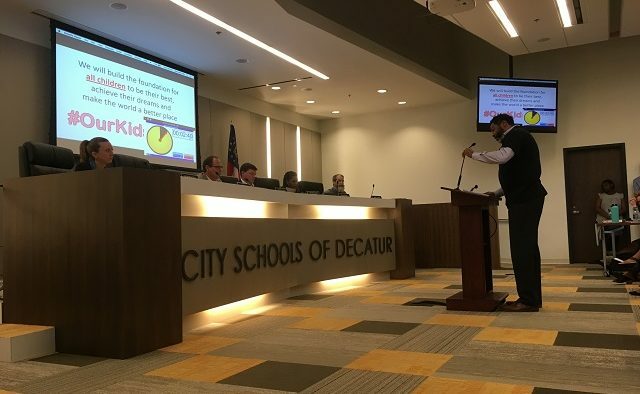 In general, black students in Decatur City Schools were reported to be more likely to have a disproportionate number of unexcused absences, tardies, and disciplinary incidents, more likely to receive free or reduced lunches, and more likely to participate in early intervention programs than their white peers. They were less likely to participate in gifted programs, varsity and junior varsity sports, or the National Honor Society. The needs assessment recommended regular equity-focused training opportunities, adjustments in resource allocation, a review of practices and policies, and expansion of hiring practices to ensure diversity. During the Sept. 11 meeting, CSD Equity Director Lillie Huddleston talked about actions the district had already taken, including equity training for school administrators, and provided a timeline of additional actions through 2019. The statement included a list of demands, among which were an end to out-of-school suspensions for K-5 students and the establishment of a grievance process to address ongoing incidents. Lily Pettus, with the Beacon Hill Black Alliance for Human Rights, during the meeting spoke of her long participation as a volunteer in the school district.